Fresh pizza is a hot item. That's why we created the all-in-one Pizza Station, which combines pizza prep and display into one attractive in-line case. The Pizza Station is a showcase for a profitable pizza operation. The self-contained refrigerated unit has a lighted display case and flip-up prep area. 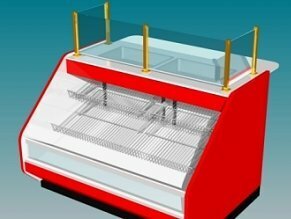 You can use the unit in-line with other deli cases or operate it separately. Either way it is an efficient use of space. Amtekco creates the hardworking Pizza Station from easy-to-clean materials known for long life and low maintenance. Completed pizzas and the ingredients stay fresh, with minimal spoilage, due to the Pizza Station's unique refrigerator unit the efficiently maintains temperatures at 36o to 38o F. Low velocity fans pull air through a unit-length evaporator, pushing cold air through a duct under the ingredients and over the display bin. The Pizza Station is available in standard lengths from 6 to 12 feet long. We can also create custom designs to match your store's design and colors. The unit is built to NSF and ETL standards and will arrive on-time and pre-wired for easy installation. You expect that from Amtekco. The Pizza Station is yet another way that Amtekco puts pizzazz in your profits.